In addition to our quantitative outcome measures, we surveyed and consulted Teaching Assistants and parents during the study to understand their views of the intervention. We asked the Teaching Assistants in the initial intervention group (1) to complete a questionnaire after 10 weeks of intervention delivery (half way into phase A). We received feedback from 30 Teaching Assistants. They reported that they enjoyed delivering the intervention (average rating of 5.8 on a scale of 1 (not at all) to 7 (very much)) and that they were satisfied with the content of the intervention (5.7). The Teaching Assistants reported that they were more confident after 10 weeks of delivering intervention (average rating of 5.8) than they were at the beginning of the project (average rating of 3.7). They also felt more competent after 10 weeks (5.9) compared to at the beginning (4.0). The Teaching Assistants reported that participating in the intervention led to increased confidence (5.6), improved skills and expertise (5.7), increased self-esteem (5.1) and greater job satisfaction (5.7). When asked to rate the impact of the intervention on the child's ability on a scale of 1 (declined) to 7 (vast improvement), the Teaching Assistants reported large positive impacts on reading ability (6.1), enjoyment of books and reading (5.8), spoken language skills (5.7) and speech clarity (5.6). After 10-weeks of delivering intervention, the Teaching Assistants were asked to attend a refresher training day. As part of this, we asked Teaching Assistants to share some of the positives and challenges they had experienced in delivering the programme. These have been grouped into themes below, focusing first on the positives and then on some of the challenges involved in delivering the programme, and how the research team responded to these. We have illustrated these with specific quotes where possible. "It (the intervention) helps so much to structure the day, makes you feel as if you have achieved something every day and the benefits to the child makes it all worthwhile"
"It has been an absolute godsend"
"Progression in books is well structured"
"The words in the language strand provide focus for the whole day"
"Improvements in skills and behaviour led to greater social inclusion in class and at playtime". "Nice to see some have remembered more than expected over the summer". "I think this (the intervention) has made the biggest difference to X out of everything we have done over the last two and a half years"
"The writing has suddenly taken off and most of these words I just had to tell her the letter and she wrote unaided! The ones she is not so confident on she asks for help which is merely me touching her hand. Am so proud of her and the reading is still progressing"
"Go for it, it's really worthwhile and seeing the results is fantastic"
"....X is coming on leaps and bounds with his reading. Remember how we'd spent two months on 'The New Pet', well he is going through two books a week at the moment. It's all very good news on this front"
"She did a really FAB thing last week. I gave her 'at' as a start point and then we added the first sound, c, b, h etc. and she sounded out and blended every one, we were GOBSMACKED. She was SO pleased with herself too." "He is reading 'Cat in the Hat' at the moment and his language is improving all the time." "Staff amazed at X's improvement and have had several people show interest in the intervention"
"Everyone is saying he talks a lot more now"
"It has had a positive impact on X's language and reading skills; many people have commented on how much X's speech has improved and that they can now understand him"
"X still doing great with the reading and retained it all over the Xmas break. Mum and Dad did their best to keep it going; they are thrilled with her progress." 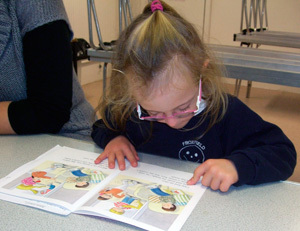 "The reading is working really well - X enjoys being able to read the easy books and is very excited when we move on to a new book"
"Reading works well - easy books give confidence as they can read them"
"The first thing X mentioned on her return to school was 'new books!'. We read some of the books that she has already mastered and she had retained them and was able to recall some of the stories." "the child loves the physical activities"
"Love making topic books and these helped progress with handwriting"
"Love language and making topic books"
"X enjoys the wide variety of different activities"
"Great fun - photos and involving her in the aspects of the 'word of the day' - it was fun"
Some Teaching Assistants reported that communication had been good with school and that they had been supported with time to prepare and deliver sessions. 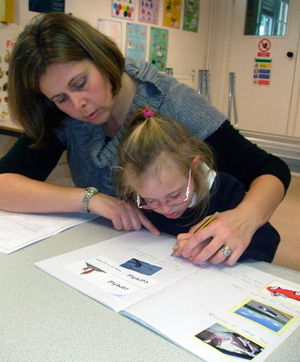 Teaching Assistants also reported that it was useful to involve the class teacher in the teaching programme e.g. by having the sight words/vocabulary targets up in the classroom. Many Teaching Assistants reported that the children were really proud of their achievements, and that they enjoyed having a record of what they have done and sharing this work with others in the class. 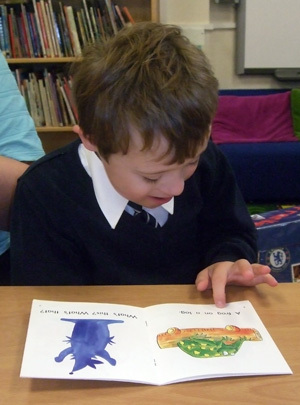 "Fantastic to be provided with books that are specifically targeted at children's exact level of ability"
"Time table does not always allow for intervention. Thursday - literacy/ICT; X always objects strongly if class go to ICT suite and he can't. Friday - no literacy; history instead." "Other activities in school getting in the way of intervention delivery e.g. sports day, etc. - can be difficult to fit in. Other Teaching Assistants noted that it could be difficult to fit the teaching programme in to the 40-minute (or 2 x 20 minute) sessions: "The 20 minutes can be a bit of a rush and do not allow TA to give child enough thinking time." Some Teaching Assistants commented on various factors which they felt impacted on the child's ability to participate in the teaching programme. Behaviour and health problems were noted as impacting on the ability to participate, as were particular difficulties with expressive language skills "Difficulties with speech sometimes make it difficult to know whether child is getting the words (both in language work and in reading)"
"Phonics - struggle with ideas and knowing what steps to take next"
"Phonics - not enough ideas to put into practice originally"
"Phonics - I don't have enough experience in delivering it." Some Teaching Assistants reported that they found it difficult to keep motivated to continue with the programme. Application of knowledge to different learning situations is really important and some Teaching Assistants reported finding it difficult to support and check this. 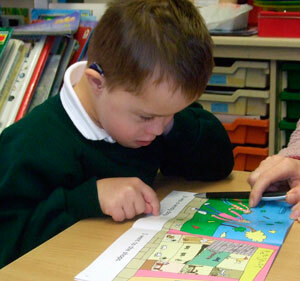 Some Teaching Assistants found it difficult to individualise the programme and make it a suitable challenge for children. "A lot of prep - we only had a day to prep for starting after the holidays"
"I'm the only one involved and no one else even knows what I do - just left to get on with it! This is fine but would be nice for them to show an interest"
"Can feel left alone for managing behaviour"
"Important that class teacher is consistent with expectations of behaviour"